This page is about a region in New Zealand. For other uses, see Wellington (disambiguation). 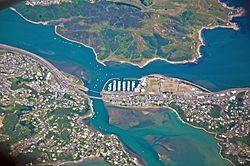 The Wellington Region (also known as Greater Wellington) is a local government region of New Zealand that occupies the southern end of the North Island. The region covers an area of 8,049 square kilometres (3,108 sq mi), and is home to a population of 504,900 (June 2016). The region is named after Wellington, New Zealand's capital city and region's seat. The Wellington urban area, including the cities of Wellington, Porirua, Lower Hutt and Upper Hutt, accounts for 80 percent of the region's population; Other major urban areas include the Kapiti conurbation of Waikanae, Paraparaumu, Raumati and Paekakariki, and the town of Masterton. In common usage the terms Wellington region and Greater Wellington are not clearly defined, and areas on the periphery of the region are often excluded. In its more restrictive sense the region refers to the cluster of built-up areas west of the Tararua ranges. The much more sparsely populated area to the east has its own name, Wairarapa, and a centre in Masterton. To a lesser extent, the Kapiti Coast is sometimes excluded from the region. Otaki in particular has strong connections to the Horowhenua District to the north. Former Wellington City mayor Celia Wade-Brown is not in favour of the region adopting a 'super city' type council like the one in Auckland, though is in favour of reducing the number of councils from nine to "three or four". The Māori who originally settled the region knew it as Te Upoko o te Ika a Māui, meaning "the head of Māui's fish". Legend recounts that Kupe discovered and explored the region in about the tenth century. The region was settled by Europeans in 1839 by the New Zealand Company. Wellington became the capital of Wellington Province upon the creation of the province in 1853, until the Abolition of the Provinces Act came into force on 1 Nov 1876. Wellington became capital of New Zealand in 1865, the third capital after Russell and Auckland. The region occupies the southern tip of the North Island, bounded to the west, south and east by the sea. 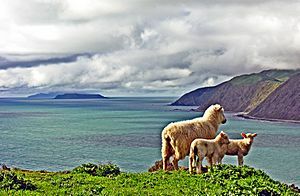 To the west lies the Tasman Sea and to the east the Pacific Ocean, the two seas joined by the narrow and turbulent Cook Strait, which is 28 kilometres (17 mi) wide at its narrowest point, between Cape Terawhiti and Perano Head in the Marlborough Sounds. The region covers 7,860 square kilometres (3,030 sq mi), and extends north to Otaki and almost to Eketahuna in the east. The Kapiti Coast, a narrow strip of coastal plain running north from Paekakariki. It contains numerous small towns, many of which gain at least a proportion of their wealth from tourism, largely due to their fine beaches. Rough hill country inland from the Kapiti Coast, formed along the same major geologic fault responsible for the Southern Alps in the South Island. Though nowhere near as mountainous as the alps, the Rimutaka and Tararua ranges are still hard country and support only small populations, although it is in small coastal valleys and plains at the southern end of these ranges that the cities of Wellington and the Hutt Valley are located. The undulating hill country of the Wairarapa around the Ruamahanga River, which becomes lower and flatter in the south and terminates in the wetlands around Lake Wairarapa and contains much rich farmland. Rough hill country, lower than the Tararua Range but far less economic than the land around the Ruamahanga River. This and the other hilly striation are still largely forested. Over three-quarters of the 504,900 people (June 2016) reside in the four cities at the southwestern corner. 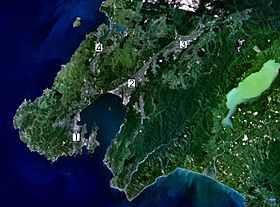 Other main centres of population are on the Kapiti Coast and in the fertile farming areas close to the upper Ruamahanga River in the Wairarapa. Along the Kapiti Coast, numerous small towns sit close together, many of them occupying spaces close to popular beaches. From the north, these include Otaki, Waikanae, Paraparaumu, the twin settlements of Raumati Beach and Raumati South, Paekakariki and Pukerua Bay, the latter being a northern suburb of Porirua. Each of these settlements has a population of between 2,000 and 10,000, making this moderately heavily populated. In the Wairarapa the largest community by a considerable margin is Masterton, with a population of almost 20,000. Other towns include Featherston, Martinborough, Carterton and Greytown. The region is by a large margin the wealthiest in the country. The most up-to-date estimates for regional GDP prepared by the Ministry for Economic Development put it at $17.5 billion in the year to March 2004, $36,700 per capita, 19% more than the Auckland Region ($30,750); 38% more than the poorest region, Northland ($26,600); and 3% more than the second-highest region, Northern South Island ($35,800). At the 2006 census the region had the largest percentages of people in the four highest income groupings ($40,001-$50,000: 8.9%, $50,001-$70,000: 10.5%, $70,001-$100,000: 5.9% and $100,001+: 5.2%) and the lowest percentage of residents in the 'loss' group (0.37%). As at December 2007 people in the region has a significantly higher average weekly income from all sources ($812/week) than other regions (18% more than second-placed Auckland, $687/week). In 2006 25.8% of employed Wellingtonians worked in professional occupations and 14.3% in clerical occupations, the largest percentage for each category of any region. Excluding 369 people in areas not covered by an official region, Wellington has the lowest percentage of technicians and trades workers (10.6%), the lowest percentage of machinery operators and drivers (4.1%) and the lowest percentage of labourers (7.1%). The region is second only to Auckland in many statistics related to breadth of ethnicity. In the 2006 census Wellington had the second-highest Asian population (8.4%, Auckland 18.9%) and the second-highest Pacific Islander population (8.0%, Auckland 14.4%). Around 25.3 percent of the Wellington region's population was born overseas, second only to Auckland (39.1 percent) and on par with the New Zealand average (25.2 percent). The British Isles is the largest region of origin, accounting for 36.5 percent of the overseas-born population in the region. Significantly, the Wellington region is home to over half of New Zealand's Tokelauean-born population. Around 47.7 percent of Wellingtonians affiliate with Christianity and 6.1 percent affiliate with non-Christian religions, while 43.9 percent are irreligious. Catholicism is the largest Christian denomination in Wellington with 14.8 percent affiliating, while Anglicanism is the second-largest with 11.9 percent affiliating. Hinduism (2.4 percent) and Buddhism (1.6 percent) are the largest non-Christian religions. The region has the second-highest proportion of women at 51.52% (Nelson 51.53%, West Coast 49.21%), age 16-29 48.86% with Otago next at 49.11%, followed by Gisborne at 49.18%, contrasting with Marlborough at 52.61%. In 2006 21.1% of Wellingtonians had a degree, compared to 6.6% on the West Coast, 17.7% for Auckland and 14.5% for Otago (though 0.97% of Otago residents have doctorate level degrees, compared with 0.87% for Wellington). Auckland and Wellington are equal lowest for "No Qualification" at 18.1%. Mobile phone use at 76.3% is exceeded only by Auckland (76.4%), followed by Waikato (75.3%). Access to the internet is 65.5%, highest equal with Auckland, followed by Canterbury (61.3%). Wellingtonians are least likely to have access to a fax machine (21.1%), after Gisborne (20.5%). Public transport in the Region is well developed compared to other parts of New Zealand. It consists of buses, trolleybuses, trains, cars, ferries and a funicular (the Wellington Cable Car). It also included trams until 1964. Buses and ferries are privately owned, with the infrastructure owned by public bodies, and public transport is often subsidised. The Regional Council is responsible for planning and subsidising public transport. The services are marketed under the name Metlink. Tranz Metro operates the metropolitan train network, running from the Wellington CBD as far as Waikanae in the north and Masterton in the east. In the year to June 2015, 36.41 million trips were made by public transport with passengers travelling a combined 460.7 million kilometres, equal to 73 trips and 927 km per capita. The Wellington region has the lowest rate of car ownership in New Zealand; 11.7 percent of households at the 2013 census did not have access to a car, compared to 7.9 percent for the whole of New Zealand. The number of households with more than one car is also the lowest: 44.4 percent compared to 54.5 percent nationally. From 2005 to 2015 there has been increase in the variety and number of native forest bird species, as well as an increase in the range of areas inhabited by these species, in Greater Wellington. Wellington Region Facts for Kids. Kiddle Encyclopedia.